The Belt. Perhaps the Holstein cow aside, is there a more recognizable mark in the livestock world? Ask a smiling 4 year old what kind of pig they want to show and most will answer ‘A belted pig!’ Have you ever noticed what breed of pig is included in most of the Ertl farm sets? Of course! It’s a belted pig! Ask the folks at American Homestead Natural Pork if the belt means something to them. 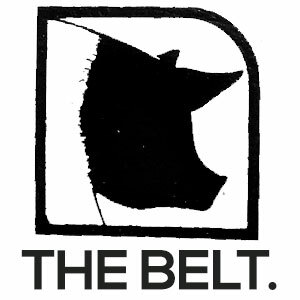 They are so convinced The Belt sells that they’ve paid a royalty in order to use a belted pig on their logo. In our showpig industry today, there is no other marking produced in greater volume, or in greater demand, than belted pigs. For years, the belt has allowed the Hampshire breed to distinguish itself from the rest and yet for all the history and all the lore, our breed is in turmoil. Over the last decade, Hampshire litter recordings and transfers have been in decline, even more rapid of late as Hampshires have become irrelevant in the commercial sector. Any notion that there is International demand seems like an oversold pipedream without strong evidence to support the claim. As registrations have fallen, Hampshire entries at Type Conferences and Junior Shows alike remain stagnant at best. The elite show pigs in today’s industry, the ones that remain in high demand, may be beltedt, but it’s a rarity for one to carry the distinction of being from Hampshire decent. After all, you don’t need a purebred Hampshire parent on either side of the pedigree, for several generations, in order to produce belted progeny. Belted crossbred sires are the dominant sire of choice in modern day showpig production and the lack of demand for Hampshire sires has slowly and surely suppressed the breed. Without the NJSA, purebred Hampshires of any quality would have little to no value. As a breed, I believe Hampshires need positive, progressive change, yet it feels like we are in the midst of a drastic turn that will push our breed even further in the wrong direction. With multiple social media platforms and an active eblast service, this mere mention in the Seedstock Edge was the only communication of this announcement to the membership. With such an important decision, one that would surely impact all Hampshire breeders, to some extent, why weren’t Hampshire members notified immediately following this vote in March? Why wasn’t this announced at the World Pork Expo during the most well attended event of the year? Was the NJSS in Louisville ever considered as an opportune time for a forum, an educational session or at a minimum, an ideal place to hang a written piece on the wall explaining the change and subsequent process? It would have been very timely considering the effective change date of July 1stand a large gathering of breeders just a few short days later. Most importantly, where was the foresight before this decision was ever made? I served on the Hampshire Board for two terms, totaling six years with my term ending after the 2016 Annual Meeting. In those six years, we met annually in March, usually for a couple of hours, as part of the NSR Annual Meeting. Once, and only once, in those six years did we ever meet in addition to the Annual Meeting and it came during the World Pork Expo. I wouldn’t need the minutes to recall the usual order of business conducted during those meetings; approve the minutes, determine officers, elect someone to the Executive Committee – always predetermined prior to the meeting; approve judges, approve a contribution to the NJSA and listen to various reports from NSR staff. There was always ample time for those yearly decisions but usually not enough time to dive into any real issues with much depth. Over the years, we discussed lots of Hampshire issues but, quite frankly, there never seemed to be enough time to solve many problems. It always felt like we were patching up the ship to make sure it could sail for another year. While I don’t recall the exact year, I vaguely remember the mention of a Michigan State University effort during one of those annual meetings. I understood that they were establishing a profile for the four breeds, ultimately creating a test to use for breed purity. I do understand and appreciate the need to maintain breed purity. I realize this endeavor is a core principal for any breed association. Even so, the idea of pursuing any effort that would shrink the Hampshire genetic pool has never appealed to me. At that time, it struck me as a regressive effort and didn’t feel like a progressive investment for the future and I maintain the same opinion today. We should be looking for ways to expand our population of genetics, and its influence in the industry, rather than reducing it. At this point, it’s obvious that leadership at the NSR forged ahead with this effort and now all breeds have adopted the new testing as the gold standard for breed purity. Throughout the history of purebred livestock, there have been many times when new genetics were needed. In this quest to purify the four breeds that make up the NSR, do we ignore all the influences of the past that have shaped the breeds for what they are today? Should we ignore the Irish influence on Yorkshires? Should we ignore the Danish influence on Durocs? What about the influential sires in the Hampshire breed that have generated well enough to garner whispers about their purity? Do we ignore those too when the vast majority of breeders have been drinking from the same well, so-to-speak? Why are we throwing rocks at glass houses? More importantly, if our quest is for purity above all else, what will any of the breeds do the next time new genetics are needed? Amidst all of this chaos, the only thing clear to me is that there could not have been enough consideration for the ramifications and unintended consequences of this new policy. As a Hampshire breeder, I would love to know what genetics were used in the pool to establish the baseline for breed purity. I can assure you that I was never contacted for Hampshire samples of any kind. I would love to understand what percentage is deemed pure and what percentage constitutes a failed test. Is this sound science or is there an acceptable gray area giving allowance for interpretation? Having experienced a Hampshire Board meeting, and knowing there could not have been enough time to discuss all the nuances and potential outcomes of this decision, I’d love to know when additional discussions took place. Did the burden rest solely on members of the Hampshire Board or did the NSR staff play a bigger role in the process? I’d love to know which breeders were privy to pre-testing that was almost certainly conducted to ensure valid scientific results, and, in the interest of a fair representation to all Hampshire breeders, I’d love to know if those breeders are currently serving on the board. What information were they provided about the testing results? Were they privy to an understanding of which animals had passed and failed before the test was official? Do those animals, which failed under pre-testing, still have pedigrees? During a past Hampshire Board meeting, I remember a Board member comparing the NSR to a Country Club and in 2018, the analogy rings true. It feels very possible that there are a select few calling the shots from a smoke-filled clubhouse lounge that is exclusive to only the good ole boys. If I sound distrustful, it’s because I am. Maybe it would be helpful to explain why I have doubt in the test and the ensuing process. In 2017, following the inaugural Hampshire-sired barrow show, the Champion Barrow, bred by us, failed his parentage test to Thunderstruck. When I questioned the test and asked for an explanation, I was told “he wasn’t close enough.” In the black and white world of Hampshires, and with scientific testing we’re asked to believe in, I don’t understand how there can be gray area. What does ‘not close enough’ really mean? Oddly enough, several Board Members didn’t know about the failed test when I asked for their opinion, in fact only the Board President and NSR Executive Staff knew about the test results. I’ll forever question the results of that parentage test, not just because of the outcome, but more specifically because of the process. The lack of transparency of a non-profit, member driven organization astounds me. I do want to reference and recognize the written piece that the Boar Stud group posted on social media. I applaud their effort and strongly agree with their position to seek transparency, clarity and modification. I know first hand how tirelessly this group has worked to ask questions and create dialog that has largely fallen on deaf ears. If this new testing procedure is really necessary, and again, my personal opinion is that it’s not, at a minimum I think the same framework and timeline should be adopted that is currently being used by the Landrace breed. There must be time to accommodate testing of ALL sires and more importantly, as testing defines which boars and sows can be part of the solution, there must be adequate time for breeders to utilize those genetics and make progeny that will pass the test at shows in the future. The expectation that barrows and gilts at NSR events must pass this new purity test starting January 1, 2019 is terribly short sighted and unrealistic. For years, Hampshire breeders have been considered the trendsetters, the influencers and the folks who’ve charted the course for all purebred swine breeders. Sadly, today, the breed that I love has become a novelty. We are following instead of leading. Why are we seemingly more concerned with preserving tradition than building the future of our breed? Why do we continue to make decisions and establish policies that make the Hampshire breed more exclusive to the established and less inclusive to anyone and everyone with an interest in The Belt? Why are we so resistant to the kind of change that would entice participation and get the breed trending the right direction? We have the mark that everyone recognizes, as Hampshire breeders, why don’t we embrace the belt as OURS and be progressive in our thinking? This is not my grandfather’s Hampshire breed anymore. It’s not even the same breed I fell in love with as a kid. We have to accept the reality of our situation and seek change if we will achieve future success. As much as I love tradition, I’m more interested in what The Belt can be for generations that are to come. Join the conversation, contact the Hampshire Board members and allow your voice to be heard for the betterment of the Hampshire breed. This entry was posted in Hampshires and tagged Duroc, Hampshire, Landrace, National Swine Registry, NJSA, NSR, Yorkshire. Bookmark the permalink.